The Great English Songbook! As infinite a source of lyrical and harmonic invention as its American cousin. Elegantly Wasted is not only a tribute to the classic English songs of the last 80 years, but draws contributions and inspiration from composers of the other lands of our gifted British Isles. 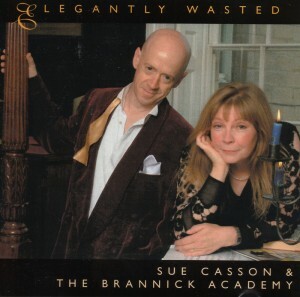 Take yourself back 20 years and become, like Sue Casson and The Brannick Academy, wistful about vinyl. Not only did it offer a chance to THINK BIG about visual presentation, but also one could change moods completely in the time it took to get up and turn the record. So for those of you keen to have your ribs tickled in an understated English way, we recommend you play the first 6 tracks. Those looking for some good old-fashioned English sentiment (but with upper lips appropriately stiffened) – start in at track 7. The more eclectic among you – just play it straight through. Go on – live dangerously. A medley of traditional tea time treats. Vocals – Casson & Brannick. Piano – Casson. Congas, bongos, guiro, cowbell, teapots & acme siren – The Brannick Academy. A tribute to the acid-tongued Adonis of late night TV. Piano and vocals – Casson. Backing vocals Casson and Brannick. Vibes, tubular bells, congas, bongos and cowbell – The Brannick Academy. A little bit of Madness inspired by Sir Noel Coward’s Brief Encounter. Piano and vocals – Casson and Brannick. Typically English (Lesley Bricusse and a touch of Anthony Rowley). A romantic odyssey. Sadly, quintessentially English didn’t scan. Vocals – Casson and Brannick. Piano – Brannick. The English abroad (or, A broad, English). Piano and Vocals – Casson. Temple blocks, maracas, castanets & tambourine – The Brannick Academy. The end of another glorious summer. Piano and vocals – Casson. Vibes – Brannick. A man, a woman, a bar. Play it. Piano – Brannick. Vocal – Casson. A selection from England’s first great pop export. Piano – Brannick & Casson. Vibes and wine glasses – The Brannick Academy. A timeless tale from London. Piano and vocals – Casson. Vibes – The Brannick Academy. English or not, we could all do with a little of that. Piano – Brannick & Casson. Lead vocal – Casson. A hymn to English eccentricity. Nothing to do with either of us, of course. Piano and organ – Casson. Vocals, backing vocals, tambourines and shouting – Casson & Brannick. The Favoured Few are Caryl Caffery (cello) and Stephen Hiscock (drums and bits). Very special people who grace our CD with their effortless and musicianship. Blessings on both (because they’re certainly not in it for the money). Additional material by Tom Blackmore.